In "The Gift Outright," which first appeared in the Virginia Quarterly Review in 1942, Robert Frost wrote that "the land was ours before we were the land's." The maps and narratives left by European explorers tell a different story, asking us to consider what role the written word may have played in "authorizing" the European possession of Native American lands. William Strachey. 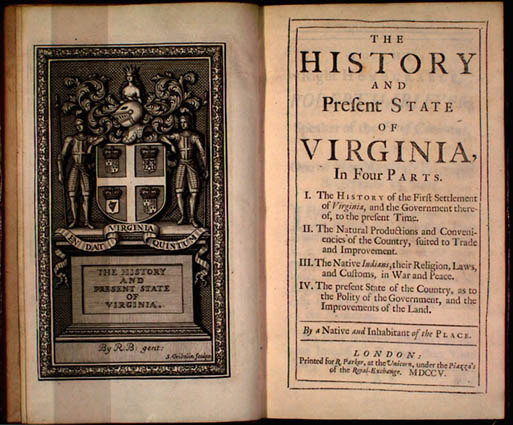 The Historie of Travell into Virginia Britania. 1612. Ed. Louis B. Wright and Virginia Freund. London: Printed for the Hakluyt Society, 1953. McGregor Library. William Strachey's Historie contains the closest thing to the first real "nature writing" from this region, a creation story told to Europeans by Iopassus, an Indian of the Potomac River. According to Strachey, when Iopassus came aboard Captain Argoll's ship on Christmas 1610 and heard the English Bible being read, "the Indian gaue a very attent eare and looked with a very wish't eye vpon him as if he desired to vnderstand what he read." When the captain pointed to an illustration of the creation of the world and asked Iopassus to "tell him the manner of their begynning," Iopassus recounted the "pretty fabulous tale indeed" reprinted here. John Smith. A Map of Virginia. With a Description of the Countrey, the Commodities, People, Government and Religion. Oxford: Printed by Joseph Barnes, 1612. McGregor Library. Shown: engraved map. 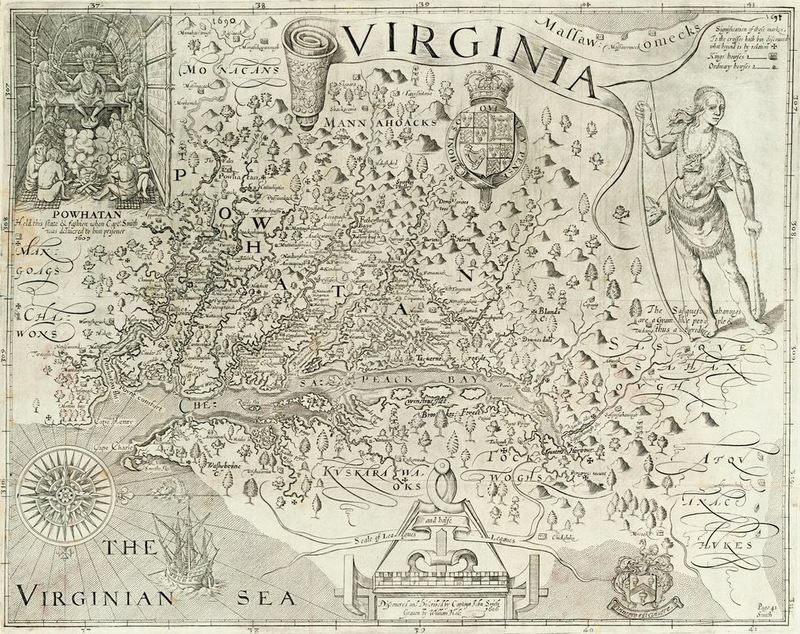 John Smith's Map of Virginia consists of an engraved map and a descriptive text with information on the location, geography, resources, and inhabitants of Virginia. An important source of information about the Indians of the Chesapeake Bay area in the early seventeenth century, A Map of Virginia also includes the earliest reference to the native residents of this region--the Monacan Indian town Smith calls Monasukapanough, which was located on the banks of the Rivanna River just east of Route 29 North. The engraved map, which in this copy is an eighth state, was prepared by William Hole, based on sketches supplied by Smith. John Farrer. A Mapp of Virginia. London, 1652. 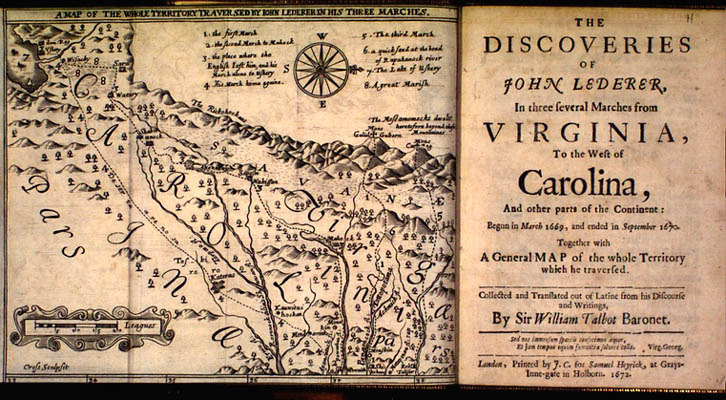 An important officer in the Virginia Company, John Farrer (or Ferrar) prepared this Mapp of Virginia for the third edition (1651) of Edward Williams's Virgo Triumphans; or, Virginia Richly and Truly Valued, first published in 1650. It was later reprinted in Edward Bland's 1651 Discovery of New Britain. In the map's third state, Farrer's daughter Virginia added many features and changed its imprint from "John Farrer Esq" to "Domina Virginia Farrer." The map featured here is a fourth state (c. 1652) in which the word Falls in the title is changed to read Hills. Note that the South Sea is only a ten days' march from the head of the James River. One of the few correct features on the map is the unbroken ridge of the Appalachians, which extends all the way to the Hudson River, although the direction is in error, running directly north and south. John Lederer. The Discoveries of John Lederer, in Three Several Marches from Virginia, to the West of Carolina, and Other Parts of the Continent: Begun in March 1669, and Ended in September 1670. Together with a General Map of the Whole Territory which He Traversed. Trans. William Talbot. London: Printed by J. C. for Samuel Heyrick, 1672. McGregor Library. Shown: "A Map of the Whole Territory Traversed By John Lederer in His Three Marches," opposite title page. Commissioned by Governor William Berkeley in 1669 to explore the lands west of the Virginia colony, John Lederer became the first European to reach the Blue Ridge Mountains and document his discoveries, which he did--appropriately enough--in The Discoveries of John Lederer. 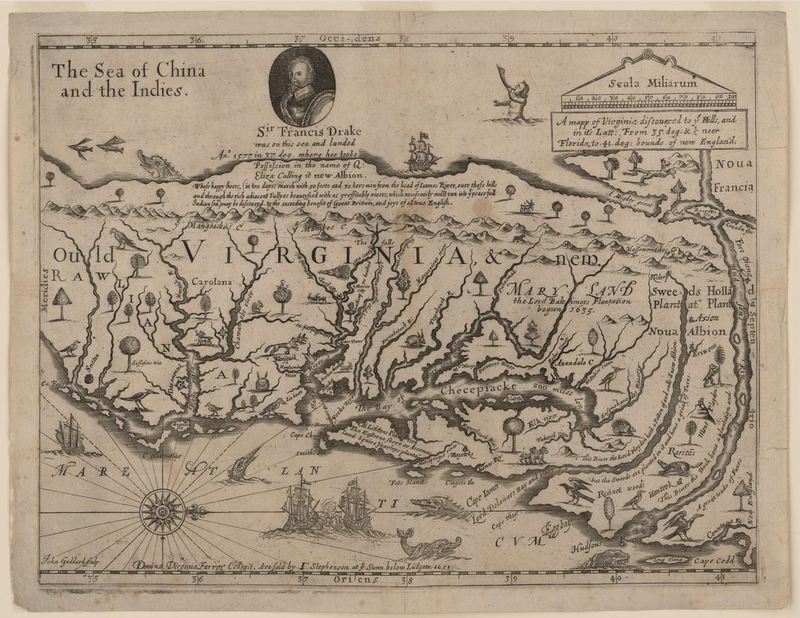 Lederer's map, which features land now included in both Virginia and North Carolina, was quickly adopted by English and continental mapmakers, eager for cartographic knowledge of this unknown region. Like Lederer's text, it unfortunately contains misleading information, which was retained in new maps until the mid-eighteenth century. Robert Beverley. The History and Present State of Virginia. London: Printed for R. Parker, 1705. McGregor Library. Shown: Title page. In what may be one of the most appreciative descriptions of Virginia beyond the Tidewater region, Robert Beverley in his History and Present State of Virginia admonishes those who see only the flatness of the coast, because "a little farther backward, there are Mountains, which indeed deserve the name of Mountains, for their Height and Bigness." Notable for its detailed natural historical descriptions, Beverley's History also offers an unusually sympathetic portrait of the Indians, whom Beverley considered fellow Virginians. Genealogical trivia: Beverley married Ursula Byrd, sister of William Byrd of Westover.